Apple iPod nano (7th gen) review | What Hi-Fi? There’s a new Nano in town. Apple’s iPod Nano is now in its 7th generation and, as with the rest of the new Apple products released in September 2012, it has undergone significant changes from its predecessor. The new iPod Nano is slimmer, lighter and taller than the 6th generation model. The screen size has increased to a rectangular 2.5in from a previous 1.55in square, making it much easier to read and swipe across the multi-touch LCD interface. The Nano is wafer thin – at just 5.4mm, it's 38% thinner than the previous model, and weighing a feathery 31g it barely makes a dent in your pocket. The clip at the back of the 6th gen Nano – which was rather useful to clip it to your clothes when jogging or at the gym – is now gone, no doubt to add to the sleek, thin design. In keeping with the rest of the Apple family, it’s encased in a sleek anodized aluminium shell, and comes finished in eight bright candy colours (silver, black, purple, pink, blue, yellow, green and red). The screen is surrounded by a new white bezel, which also includes the home button seen on iPhones – a Nano first. It makes controlling and using the Nano more intuitive and convenient. The Nano’s screen has a resolution of 240 x 432 at 202 pixels per inch (PPI), compared to the previous Nano’s 240 x 240 at 220 PPI. The larger screen means the icons don’t look cluttered, and it’s still small enough for the graphics to look sharp and smart. One thing to note is the circular icons with new graphics – a departure from the previous square icons. It looks neat, and gives it a distinctive look compared to the iPod Touch and previous Nano models – and we have to admit to using the word ‘adorable’ to describe its overall looks. Touchscreen responsiveness and general use is a delight – it’s fast, smooth, and just really lovely to use. Compared to the previous model’s tiny and fiddly screen, there’s more space to comfortably swipe across the screen to navigate between menus. That screen does love collecting fingerprints, though. While there's no iOS6 software to worry about, the Nano's operating system is simple and neat, with design tweaks all around. The volume controls have moved to the left edge, with the addition of a pause button in the middle. Scrolling through your playlists, songs and albums is much easier thanks to the longer screen; the clock faces and wallpapers have been revamped; and there are extra features in the Fitness app, such as inputting your height and weight for greater accuracy when you go jogging or to the gym. In the box you’ll find the Nano is supplied with the new Lightning-to-USB connector cable, and a pair of Apple's redesigned EarPods – although they're the type without the in-line volume controls (which you can buy for another £25). There’s no speaker on the Nano, so all your work will be done with headphones – plug them in to activate both the FM radio tuner and the voice memos app. One thing we haven’t mentioned yet is that through some wizardry (and science), these new EarPods don’t tangle into an evil knot of mess like the old Apple earphones. We’ve been stuffing them into our coat pockets and, while they do twist like phone cords, they don’t tangle into impossible knots – it’s a little thing, but we appreciate it. The iPod Nano is at its heart a dedicated media player, rather like a stripped down iPod Touch. 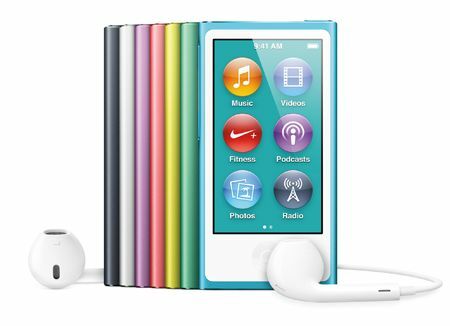 With no wi-fi or cellular data, there’s no internet browsing or games apps available – sonsequently the 7th generation iPod Nano is only available in 16GB, costing £130. It does have the latest Bluetooth technology on board though, with the transmitter housed behind the little strip of plastic at the back. One of the features of this new Nano is the return of the video app. Video playback has come and gone over the course of the iPod’s history, and the increased screen space on the new Nano means you can once again play widescreen videos. The Nano’s battery lasts for up to 3.5 hours of video playback, and it supports 720x576 pixel video at 30 frames per second. But it does beg the question – would you really watch videos on such a small-screened player? Currently, tablets and mini-tablets are all the rage, overtaking smartphones for their more desirable bigger screens – all the better to watch videos on. When you can watch your favourite TV shows and films in glorious HD on 7in to 10in screens, watching videos on a tiny 2.5in screen isn’t an obvious option. Even the new iPod Touch with its 4in screen would be a better bet. But there is something charming and sweet about watching videos on such a small, light screen. It feels like a bit of a novelty, and you can store small clips of home videos or your favourite Doctor Who episode, for example, for quick and easy sharing, or when you just fancy something quick to watch when waiting for the train to arrive. It’s not a retina screen, but when packed into a 2.5in screen the picture quality is pleasantly sharp, clear and detailed. The colours are rich and dynamic, with good contrasts levels showing up dark shadows alongside bright whites rather impressively. The small screen isn’t exactly ideal for long term viewing, though. But it’ll be as a music player that you’ll get the most out of your iPod Nano. Sync with your iTunes to store podcasts, audiobooks and playlists of songs to suit every occasion and mood. Start off with Jimi Hendrix’s All Along The Watchtower and you get a good dose of rhythm, detail and dynamics. But that’s just with the supplied Apple EarPods – which can give an exaggerated brightness to the overall sound. We’d suggest switching to higher quality earphones for a more revealing listen. Plug in either the SoundMagic E10s (£35, above) or the even better Beyerdynamic DTX 101iEs (£65) and you’ll find Birdy’s ethereal vocals on Shelter clearer and subtler in a much wider soundstage. There’s also good weight to basslines, alongside expressive highs. Compared to the previous generation, the new Nano is a step ahead in sound quality, with more clarity, detail and transparency giving a richer sound. It’s also a much more refined sound, with little of the hard edge of the previous model. Once again, Apple does play up to the niche market – like the iPod Touch, the Nano does have very specific functions for specific uses. While there aren’t many high-end portable music players on the market, the 7th generation Nano is a clear step ahead of its predecessors in terms of design, ergonomics and performance.